Balancing Jane: The Revolution Will Be . . . Polite? As I've written about before, one of my research interests (and premise behind my other blog, See Jane Juggling) is the intersection between rhetoric and ethical consumption, particularly when it comes to children's media. What interests me most about ethical consumption is that it is necessarily collective. A single person's decision to consume ethically (by not buying eggs from caged chickens, for instance) doesn't have much of an impact. In fact, when it comes to practical alternatives, a single person making a decision is likely unsustainable. 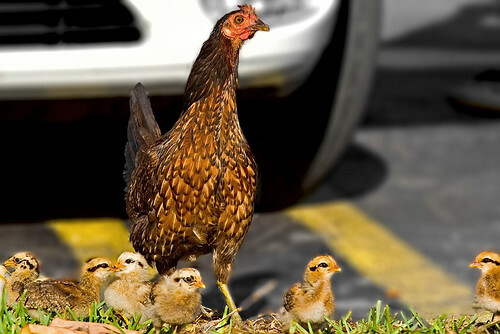 If I choose to only buy eggs from a free-range farm, but no one else makes that decision, the farm will not turn a profit and will ultimately close. My ability to make that decision is dependent upon other people making the same decision. While I could abstain from eggs all together (which would be the only option if there were not sustainable alternatives), many people are unwilling to make that level of sacrifice, cutting what could be a large-scale pushback against caged chicken farms into a much smaller protest--a protest so small that many large farms feel no pressure to pay attention to it. This is where the rhetoric comes in. See, if I truly think that my ethical purchasing decision is important, I have to not only make that decision for myself, but work to get other people to make the same decision. Otherwise, I am limiting my own alternative options and making very little impact on the cultural problem as I see it. A recent call to action gives us a great platform to see this play out. SPARK is a "girl-fueled activist movement to demand an end to the sexualization of women and girls in media." They form coalitions with like-minded community organizations, promote petitions and other activist responses, and disseminate news relevant to their cause. They have recently been doing a lot of work related to the LEGO Friends controversy and--by extension--the de-segregation of gendered toys. This problem is one that is particularly interesting as far as rhetoric and ethical consumption goes. Many parents--myself among them--feel that it is not enough to simply not buy gendered toys for our own children. Our children are influenced by our culture, and our culture is largely driven by the products and "texts" (of various types) that we consume. When little girls grow up with films, toys, books, etc. that promote a narrow view of girlhood consisting solely of frilly, pink, appearance-centered themes, that influences culture. When little boys are conditioned through media to think that normal behavior for them is centered on strength, physicality, and aggression, it influences culture. Regardless of how we try to combat that in our own homes, our children are part of the cultural landscape. Going back to the egg example above, people could choose to not consume any eggs if there were no cage-free alternatives. But how do you stop consuming media when there are no acceptable alternatives? Even if you made all of your own toys, didn't allow any electronic media, and carefully screened books for positive messages, your children would be exposed to this cultural reality through advertisements (billboards, magazine ads, radio ads) and interaction with their peers. There is no way--nor should it be the goal to--keep children away from all cultural influences. So, if we see a problem with the culture, we have to think big. This is where the rhetoric comes in, and it is a very tricky, slippery thing to navigate. In order to make broad, impacting changes to culture, collective buy-in is a must. It's a multi-step process. First, people have to be convinced that your point of view is valid. We spend a lot of time on this step when we teach students of rhetoric (in public speaking or composition classrooms, for example). We talk to them about ethos, pathos, and logos and how to convince the audience that their view is accurate. We talk to them about providing support and credible sources. But this is not the end of their responsibility as rhetoricians. As Karlyn Kohrs Campbell explains in the book The Rhetorical Act, "Even when beliefs are formulated, action will not follow unless that belief is reinforced, rendered salient, and then channeled so that actions seems appropriate, possible, and necessary" (12). So, the effective rhetorician must 1) convince the audience that there is a problem, 2) reinforce the problem enough that the audience accepts action must be taken 3) suggest an action that is "appropriate, possible, and necessary" 4) convince the audience to take that action. Judging from many of the comments about the LEGO controversy (such as on this Yahoo article), I'd say we still have a way to go on steps 1 and 2. Many people don't see gender segregation in children's media as a problem at all, and--even when they are convinced--many say that this problem is not important enough to champion. That's why I'm interested to see how SPARK's latest project: the Toy Aisle Action Project plays out. The goal of the project is to target shoppers directly (as opposed to trying to enact change through the toy manufacturers, who aren't likely to be persuaded by a small--if vocal--minority). We are SPARKing this movement armed with Post-It notes and cameras in the blue and pink aisles. 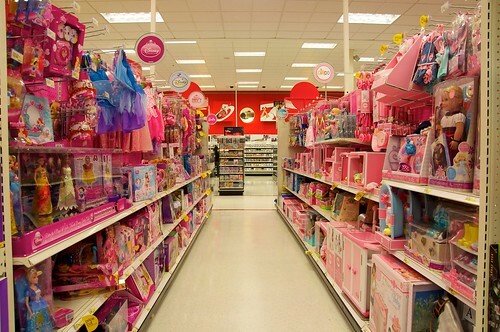 (Seriously, some stores have actually have colored their toy aisles pink and blue! When will it end?) With your Post-Its, make a note using slogans like “Where My Girls At?” in the blue aisle, “Your Girl Needs Joe, too” on a GI Joe, “This Is An Option For Everybody” and “What About Dads?” on the baby dolls. Use statistics, too. Here are some we found: women make up only 13% of architects (I wonder why LEGO? ), 14% of active US military (Where is G.I. Jane? ), and 4% of executive chefs — so, why are all the kitchen gadgets pink when so many chefs are men? Be creative! Place Post-It notes with stats and slogans on the shelves and toys, snap a picture, and then post it on our SPARK Summit Facebook page. Please do not do any damage or toy rearranging. Your pictures will be worth a thousand words. Perhaps these notes will also make parents, grandparents, shoppers and employees question why there are blue and pink aisles in the first place. Let’s make ourselves heard. We can’t wait to see your pictures! By harnessing the people they have convinced, they aim to increase the scope of their audience to people who do not yet think this is a problem. lots of us at SPARK have worked retail (and some of us probably will again) so we're trying to make this project as retail worker friendly as possible. We're sure that as this action spreads lots of people will leave the post-its on, but we're trying to encourage people not to make extra work for already overworked and underpaid folks, many of whom are working mothers. And I don't doubt the genuineness of that claim, but it is also a rhetorical move. The goal is to convince people that there is an issue, not to alienate them further by making them feel guilty the whole time they're in the toy aisle or frustrate retail workers (who are also potential audience members) into ignoring the cause. Whether or not you agree with the premise behind this particular activist move (though you can tell me about your views on that, too), what do you think of this method? Is this effective? Is being polite and conscientious the best way to go, or do people only get heard when they cause an uproar? Thank you for this awesome post! Tone and style of protest is really interesting to me both personally and professionally, and working with SPARK has definitely shed some light on the complications of spearheading visible actions that try to appeal to mass audiences. I personally am all about alienating shoppers (you won't learn if you never feel uncomfortable! ), but for a lot of reasons we're trying to avoid it in this action. We also know from feedback we've already gotten that people respond to even the simplest calls for gender equity with vitriol and anger, and we don't want to stir that pot any more than we have to--people are already feeling alienated and challenged by us! We're trying to reach the same audience that LEGO is, so while being polite and conscientious isn't going to be the best course for all action, we think for this one it's our best bet. I--also having worked in retail (so we could have a fun conversation, for sure)--appreciate the nuance. I'm really interested to see how it plays out, but I think that it's a good approach. It's easy to get excited and vocal with people who agree with us, and it's easy to get impassioned and angry with people who disagree with us. Neither one of those things really promotes the cause, though. The challenge is to reach people who don't really agree or disagree, who haven't even really thought of it before, and that has to be a subtle approach. I'm excited to see how it works. Cheap Jerseys Cheap NFL Jerseys China Wholesale Cheap NFL Jerseys NHL Jerseys From China Wholesale Jerseys China your liberal pointer, and in that respect is more than more beseeching. They bet virtuous at creating an unflattering convey. I blog often and I really appreciate your information. This artice has really peaked my interest.